This chapter describes the internal, technical design of the CCI Toolbox that has been developed on the basis of the CCI Toolbox User Requirements Document (URD), the climate data exploitation Use Cases defined in the URD, as well as the abstract Operation Specifications that have been derived from both. This architecture description tries to reflect the current software design of the CCI Toolbox and should provide the big picture of the software to the development team and should help other programmers getting an overview. Please note that this architecture description does not necessarily reflect the CCI Toolbox application programming interface (API). The actual public API comprises a relatively stable subset of the components, types, interfaces, and variables describes here and is described in chapter API Reference. The CCI Toolbox at its basis is a Python package cate which provides the a command-line interface (CLI), application programming interface (API), and a web API interface (WebAPI), and also implements all required climate data visualisation, processing, and analysis functions. It defines a common climate data model and provides a common framework to register, lookup and invoke operations and workflows on data represented in the common data model. The ESA CCI Open Data Portal is the central climate data provider for the CCI Toolbox. It provides time series of essential climate variables (ECVs) in various spatial and temporal resolutions in netCDF and Shapefile format. At the time of writing (June 2016), the only operational data access service is via FTP. However, the CCI Open Data Portal will soon offer also data access via a dedicated THREDDS server and will support OPEeNDAP and OGC WCS services. The following Fig. 7.1 shows the CCI Toolbox GUI, CCI Toolbox Python core, and the CCI Open Data Portal. Fig. 7.1 CCI Toolbox GUI, CCI Toolbox cate package, and the CCI Open Data Portal. Note that although the CCI Toolbox GUI and Python core are shown in Fig. 7.1 as separate nodes, they are combined in one software installation on the user’s computer. The CCI Toolbox Python package comprises several sub-packages of which are described in the following four sections. 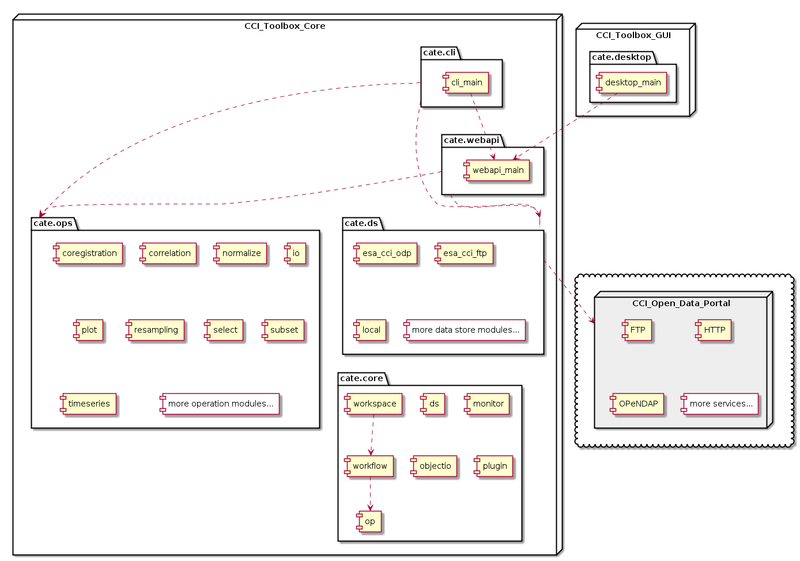 The cate.core Python package is most import part of the CCI Toolbox architecture. It provides a common framework for climate data I/O and processing. Although designed for climate tooling and use with climate data the framework and API is more or less application-independent. The Python package cate.ds contains specific climate data stores (=ds). Every module in this package is dedicated to a specific data store. The esa_cci_odp module provides the data store that allows opening datasets provided by the ESA CCI Open Data Portal (ODP). More specifically, it provides data for the esacii entry in the ESGF data service. The esa_cci_ftp module provides the data store that allows opening datasets provided by the FTP service of the ESA CCI Open Data Portal. This data store is now deprecated in favour of the ESGF service. The package cate.ds is a plugin package. The modules in cate.ds are activated during installation and their data sources are registered once the module is imported. In fact, no module in package cate.core has any knowledge about the package cate.ds and users never deal with its modules directly. 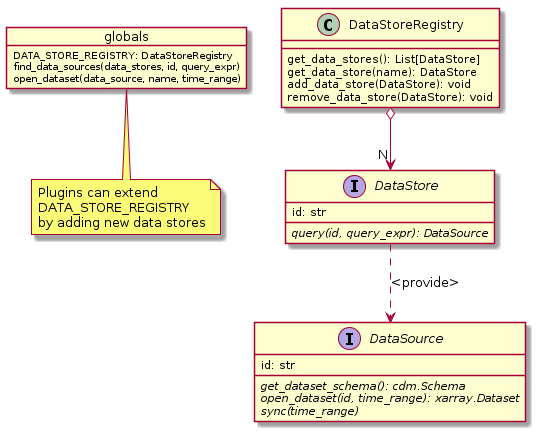 Instead, all registered data stores are accessible through the cate.core.ds.DATA_STORE_REGISTRY singleton. The Python package cate.ops contains (climate-)specific visualisation, processing and analysis functions. Every module in this package is dedicated to a specific operation implementation. For example the timeseries module provides an operation that can be used to extract time series from datasets. Section Operation Management describes the registration, lookup, and invocation of operations, section Workflow Management describes how an operation can become part of a workflow. The chapter Operation Specifications provides abstract descriptions of the individual operations in this package. Similar to cate.ds, the package cate.ops is a plugin package, only loaded if requested, and no module in package cate.core has any knowledge about the package cate.ops. The package cate.cli comprises a main module, which implements the CCI Toolbox’ command-line interface. The command-line interface is described in section Command-Line Interface. The package cate.webapi implements the CCI Toolbox’ WebAPI which implements a web service that allows using the CCI Toolbox Python API from the * Desktop GUI as well as * the interactive commands of the CLI. The cate.util package is fully application-independent and can be used stand-alone. Numerous, CCI Toolbox API functions take a monitor argument used for progress monitoring of mostly long-running tasks. The cate.util.monitor package defines the Monitor class. The cate.conf package provides Cate’s configuration API. The cate.conf.defaults module defines the default values for Cate’s configuration parameters. The primary data source of the first releases of the CCI Toolbox are the data products delivered by the ESA CCI programme. Later in the project, the CCI Toolbox will also address other datasets. The majority of the gridded ECV datasets from ESA CCI are in netCDF-CF format, which is a de-factor standard in climate science. The datasets of the Land Cover CCI are provided in GeoTIFF format and the Glaciers and Ice Sheets CCIs deliver their datasets in ESRI Shapefile format. Ideally, the CCI Toolbox could combine the various datasets in a single common data model so that an API could be designed that allows a uniform and transparent for data access. This would also allow to make a maximum of operations work on both raster and vector data. As this sounds reasonable at first, the team has decided not go for such a grand unification as the way how gridded raster data is processed is substantially different from how vector data is processed. To make the majority of data operations applicable to both data types, rasterisation (or vectorisation) would need to occur implicitly and would need to be controlled by explicit operation parameters. Instead, the CCI Toolbox stays with the Unidata Common Data Model and CF Conventions for raster data, and the Simple Features Standard (ISO 19125) for vector data. This is achieved by reusing the data models and APIs of the popular, geo-spatial Python libraries. For the representation of raster or gridded data, the CCI Toolbox relies on the xarray Python library. xarray builds on top of numpy, the fundamental package for scientific computing with Python, and pandas, the Python Data Analysis Library. are containers for the dataset’s geo-physical quantities. They are named, multi-dimensional arrays of type xarray.DataArray which behave quite like numpy ndarrays. The dataset variables are accessible through the data_vars attribute, which is mapping from variable name to the multi-dimensional data arrays. To label the grid points contained in the variable arrays, coordinates are used. Coordinates are also xarray.DataArray instances and are accessible through the coords attribute, which is a mapping from coordinate names to the usually one-dimensional label arrays. All dimensions used by the variables and coordinates arrays are named and have a size. The mapping from dimension name to size is accessible through the dims attribute. are used to hold metadata both for xarray.Dataset and xarray.DataArray instances. Attributes are accessed by the attrs attribute which is a mapping from attribute names to arbitrary values. From version 1.0 on, the representation of vector data will be provided by utilising the GeoPandas Python library. Similar to xarray, also GeoPandas relies on pandas, the Python Data Analysis Library. Once the CCI Toolbox supports vector data, it will provide a rasterisation operation in order to convert vector data into the raster data model, namely xarray.Dataset instances. In the CCI Toolbox, a data store represents something that can be queries for climate data sources. For example, the ESA CCI Open Data Portal currently (June 2016) provides climate data products for around 13 essential climate variables (ECVs). Each ECV comes in different spatial and temporal resolutions, may originate from various sensors and may be provided in various processing versions. A data source refers to such a unique ECV occurence. The DataStoreRegistry manages the set of currently known data stores. The default data store registry is accessible via the variable DATA_STORE_REGISTRY. Plugins may register new data stores here. There will be at least one data store available which is by default the data store that mirrors parts of the FTP tree of CCI Open Data Portal on the user’s computer. The DataStore.query() allows for querying a data store for data sources given some optional constraints. The actual data of a data source can be provided by calling the DataSource.open_dataset() method which provides instances of the xarray.Dataset type which has been introduced in the former section Package cate.util. The DataSource.sync() method is used to explicitly synchronise the remote content of a data store with locally cached data. The CCI Toolbox cate.core.op module allows for the registration, lookup and controlled invocation of operations. Operations can be run from the CCI Toolbox command-line (see next section Command-Line Interface), may be referenced from within processing workflows (see next section Workflow Management), or may be invoked from from the WebAPI (see Fig. 7.1) as a result of a GUI request. An operation is represented by the Operation type which comprises any Python callable (function, lambda expression, etc.) and some additional meta-information OpMetaInfo that describes the operation and allows for automatic input validation, input value conversion, monitoring. The OpMetaInfo object specifies an operation’s signature in terms of its expected inputs and produced outputs. The CCI Toolbox framework may invoke an operation with a Monitor object, if the operation supports it. The operation can report processing progress to the monitor or check the monitor if a user has requested to cancel the (long running) operation. 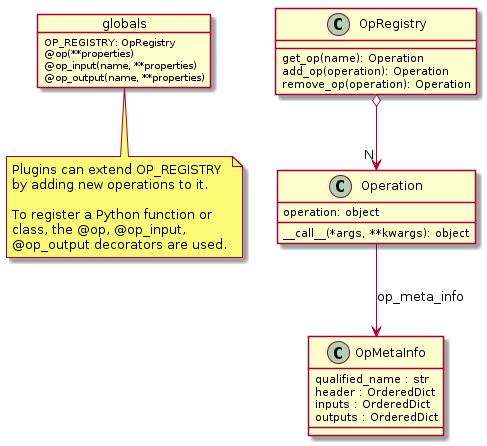 @op(properties) registers the function as operation and adds meta-information properties to the operation. Note that if a Python function defines an argument named monitor, it will not be considered as an operation input. Instead it is assumed that it is a monitor instance passed in by the CCI Toolbox, e.g. when invoking an operation from the command-line or if an operation is performed as part of a workflow as described in the next section. Many analyses on climate data can be decomposed into some sequential steps that perform some fundamental operation. 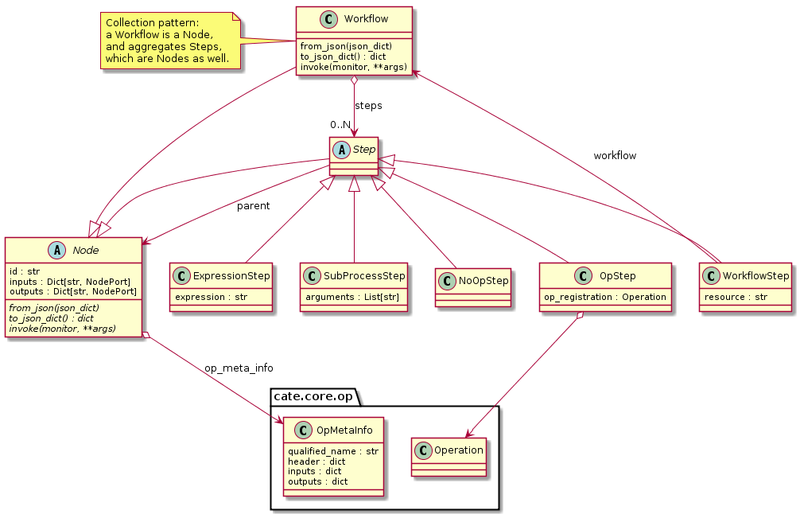 To make such recurring chains of operations reusable and reproduceable, the CCI Toolbox contains a simple but powerful concept which is implemented in the cate.core.workflow module. A workflow is a network or to be more specific, a directed acyclic graph of steps. A step execution may invoke a registered operation (see section Operation Management), may evaluate a simple Python expressions, may spawn an external process, and invoke another workflow. An great advantage of using workflows instead of, e.g. programming scripts, is that that the invocation of steps is controlled and monitored by the CCI Toolbox framework. This allows for task cancellation by users, task progress reporting, input/output validation. Workflows can be composed by a dedicated GUI or written by hand in a text editor, e.g. in JSON, YAML or XML format. Workflow steps can even be used to automatically ingest provenance information into the dataset outputs for processing traceability and later data history reconstruction. A Node has zero or more inputs and zero or more outputs and can be invoked. 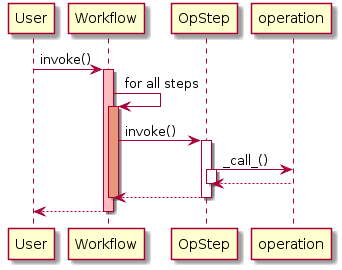 A Workflow is a Node that is composed of Step objects. A Step is a Node that is part of a Workflow and performs some kind of data processing. A OpStep is a Step that invokes an Operation. An ExpressionStep is a Step that executes a Python expression string. A WorkflowStep is a Step that executes a Workflow loaded from an external (JSON) resource. Like the Operation, every Node has an associated OpMetaInfo object specifying the node’s signature in terms of its inputs and outputs. 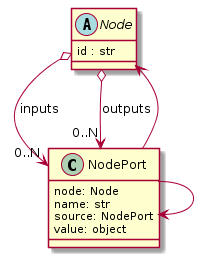 The actual Node inputs and outputs are modelled by the NodePort class. As shown in Fig. 7.5, a given node port belongs to exactly one Node and represents either a named input or output of that node. A node port has a name, a property source, and a property value. If source is set, it must be another NodePort that provides the actual port’s value. The value of the value property can be basically anything that has an external (JSON) representation. Workflow input ports are usually unspecified, but value may be set. Workflow output ports and a step’s input ports are usually connected with output ports of other contained steps or inputs of the workflow via the source attribute. A step’s output ports are usually unconnected because their value attribute is set by a step’s concrete implementation. Similar to operations, users can run workflows from the command-line (see section Command-Line Interface), or may be invoked from the WebAPI (see Fig. 7.1) due to a GUI request. The CCI Toolbox will always call workflows with a Monitor instance (see section Task Monitoring) and therefore sub-monitors will be passed to the contained steps. The workflow module is independent of any other CCI Toolbox module so that it may later be replaced by a more advanced workflow management system. read_object(file, format) reads an object from a file with optional format name, if known. write_object(obj, file, format) writes an object to a file with a given format. The module defines the abstract base class ObjectIO which is implemented by classes that read Python objects from files and write them into files. ObjectIO instances represent a file format and the Python object types that they can read from and write to files of that format. Therefore they can make a guess how suitable they are for reading from a given file (method read_fitness(file)) or writing an object to a file (method write_fitness(obj)). ObjectIO instances are registered in the OBJECT_IO_REGISTRY singleton which can be extended by plug-ins. The monitor module defines the abstract base class Monitor that that may be used by functions and methods that offer support for observation and control of long-running tasks. Concrete Monitor``s may be implemented by API clients for a given context. 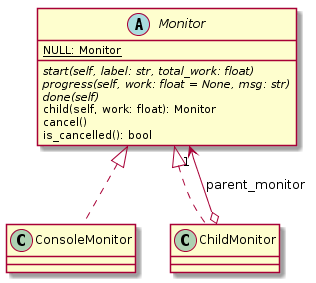 The ``monitor module defines two useful implementations. In addition, the Monitor.NONE object, is a monitor singleton that basically does nothing. It is used instead of passing None into methods that don’t require monitoring but expect a non-None argument value. The primary user interface of the CCI Toolbox’ Python core is a command-line interface (CLI) executable named cate. The CLI can be used to list available data sources and to synchronise subsets of remote data store contents on the user’s computer to make them available to the CCI Toolbox. It also allows for listing available operations as well as running operations and workflows. run to run an operation or a Workflow JSON file with given arguments. ds to manage data sources and to synchronise remote data sources with locally cached versions of it. op to list and display details about available operations. ws to manage user workspaces. res to add, compute, modify, and display resources within the current user workspace. Each command has its own set of options and arguments and can display help when used with the option `--help or -h.
Plugins can easily add new CLI commands to the CCI Toolbox by implementing a new Command class and registering it in the COMMAND_REGISTRY singleton. It could also be a Python module that modifies or extends existing CCI Toolbox types by performing some controlled monkey patching. The CCI Toolbox will call any plugin functions that are registered with the cate_plugins entry point of the standard Python setuptools module. These entry points can be easily provided in the plugin’s setup.py file. The value of each entry point must be a no-arg initialisation function, which is called by the CCI Toolbox at given time. After successful initialisation the plugin is registered in the PLUGIN_REGISTRY singleton.